Place 2 teaspoons pickling spice, 6 whole cloves, and 5 whole allspice in large tea ball or tie in cheesecloth. Set aside. Put ½ cup water in a large, non-reactive saucepan. 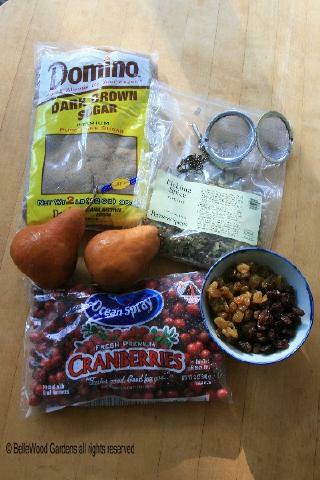 Rinse and pick over 4 cups of fresh cranberries, add to saucepan. Measure ½ to ¾ cups each dark raisins and golden raisins, add to saucepan. Peel, core and coarsely chop 3 or 4 firm-ripe winter pears, add to saucepan. Add 2 ½ cups dark brown sugar. Stir to mix ingredients. Add spices in tea ball to saucepan, burying it in the other ingredients. Bring to boil over high heat. Reduce heat to low, and simmer for 20 minutes, stirring occasionally. Cook until thickened. Remove spices. Allow chutney to cool, pack into jars and refrigerate. It will keep well for 6 weeks to two months under refrigeration. To bottle, pack while hot into hot, sterilized canning jars. Leave ½ inch head-space. Seal with two-piece metal lids, and process in boiling water bath for 10 minutes. Oooh. Might make a nice change from cranberry sauce.